At JAN-PRO we’ve always taken pride in being first to bring the latest in technology to our industry. The EnviroShield® system represents our greatest advance yet: an exclusive JAN-PRO service that combines a state-of-the-art sprayer delivery system with a disinfectant that is proven and rated in the safest category possible. EnviroShield – The Science of Disinfecting. 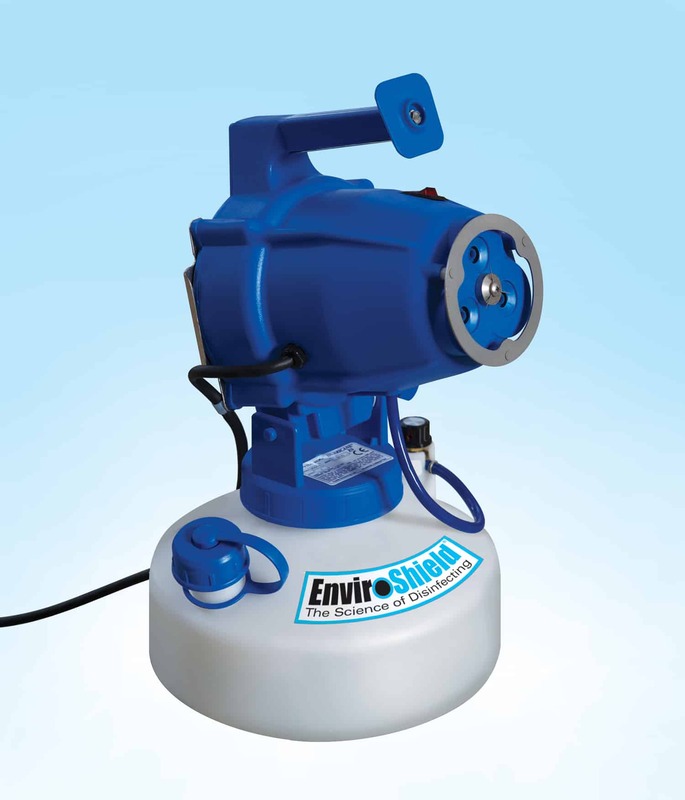 EnviroShield is an electrostatic spray disinfectant system unlike anything else available. It uses a series of different sprayer models designed for specific areas and applications. They all feature a sprayer nozzle that adds an electrostatic negative charge to the disinfecting solution as it is applied so that it actually surrounds and clings to the surfaces it touches, killing harmful bacteria. What is the disinfecting agent used in the ENVIROSHIELD process? Our process has harnessed the power of chlorine dioxide in a safe and stable formulation. The system delivers controlled micro-bursts of chlorine dioxide to microbes resulting in the physical destruction of a multitude of dangerous organisms. Once the microbe is destroyed, the disinfecting agent ceases its reactive process, insuring no free chlorine dioxide will be released eliminating any health risk or physical hazard. Yes, totally. The lack of special usage, storage and biohazard disposal requirements make it green friendly, and safe for all indoor environments. The EnviroShield spray disinfecting system with the disinfecting agent provides your environment with the perfect disinfecting combination. You get the efficiency of complete disinfecting coverage on and around all the surfaces in your facility and the absence of any health risks or side effects for all your occupants and associates. EnviroShield really does bring you the science of disinfecting, and it’s available exclusively from your local JAN-PRO franchisee. The average keyboard has 2.3 million germs, which is the number of germs on 449 toilet seats. Office toilet seats had 49 germs per square inch, he found. But desktops had almost 21,000 germs per square inch. Phones were worse – more than 25,000 germs per square inch. If that’s not disturbing enough, desks, phones and other private surfaces are also prime habitats for the viruses that cause colds and flu. Workers in the United States miss an average of 1.5 days per year solely because of the flu and that could cost businesses $20 billion in lost productivity this year, said Harvard University health economist David Cutler. While sick, an employer is paying the sick employee to come in and work while they are suffering from a condition that knocks off two out of 8 hours of the day. In a sense the employer is paying them for a full day of work but they are only delivering 75% of that. – All the while passing your germs on to your co-workers. EnviroShield’s 100% disinfectant coverage will eliminate these problems, which will improve overall employee health and wellness, as well as reducing absenteeism due to illness.